Why invest now in American Real Estate? 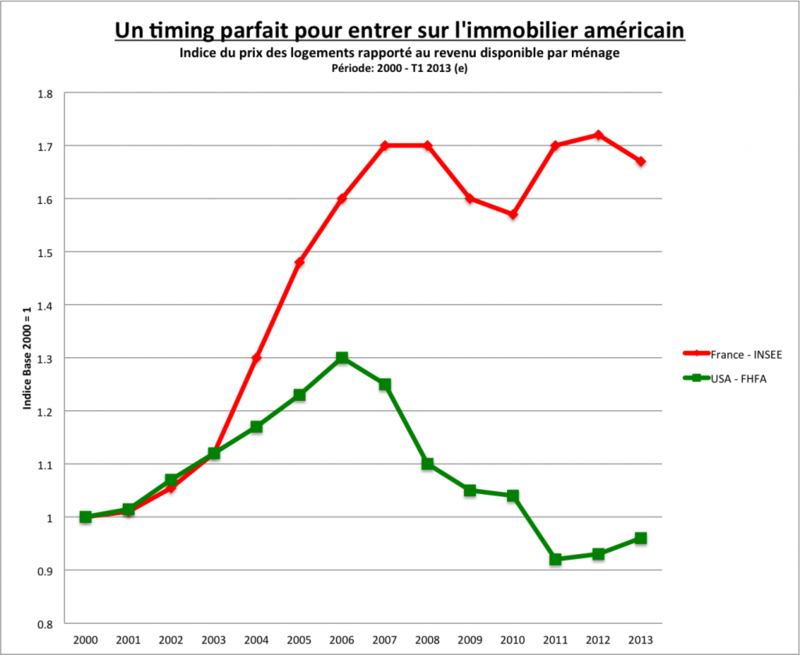 Si les avantages fiscaux et les garanties locatives prêchent en faveur de l’immobilier meublé français, la courbe ci-contre montre le décalage actuel de l’immobilier américain et donc l’opportunité d’y investir. 1) Purchasing power of Europeans has rarely been so high since the creation of the €uro in 1999. +64% increase in 13 years! A million dollar property was worth 1 215 000€ in 2000. Today, the same property is still around a million dollars, but that amounts to ‘just’ 738 621€. The purchasing power of a client paying in euros has automatically risen by 64%. … to meet its 2000 level. Data of historical selling prices show properties can be bought 3 to 4 times cheaper than pre-crises prices, if negotiated properly. - Seized properties sold at auctions at a minimized price. The depressed real estate market has drawn prices down, but for how long? - We are fast approaching the 5-year-anniversary meaning insolvent households of 07/08 have their credit history cleared and can borrow again. All of the above tend to push average prices up. Our analysis being shared among many professionals, European, Russian & Asian investors gradually turn to this market. This is al the more true considering the medium term potential gains on the French/European market are probably limited. It is likely that current prices of 1000 to 1500€ per square meter for beautiful properties with high-end amenities will not last long. Whether it is for renting, or to use personally, the appeal of buying real estate in the USA is obvious, but the difficulty of embarking on such project alone must not be underestimated. This is why we offer our help all along, and the help of local real estate experts that we have selected. We have developed a concept allowing one to benefit from this exceptional situation, gaining from the recovery of the real estate market and/or that of the U.S. dollar.